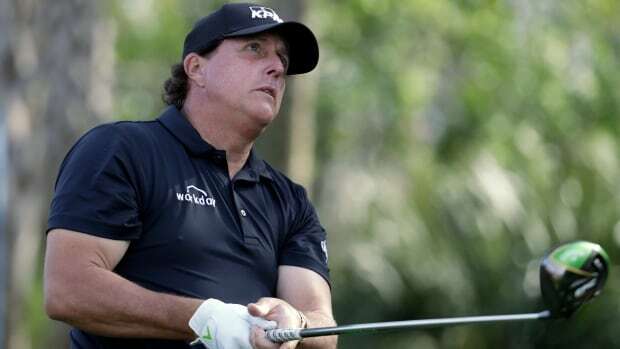 Phil Mickelson says he might be “more shocked than anyone” to learn that a college consulting company he has used the last three years has been accused of orchestrating a massive bribery scheme. He said he never contributed to William “Rick” Singer’s foundation tied to his California-based company, Edge College & Career Network, but used the service to find the right fit for his children. Federal prosecutors said parents paid Singer millions of dollars to bribe their children’s way into college. Some of the payouts went to coaches and administrators to falsely make their children look like star athletes, and Singer also hired ringers to take college entrance exams for students and paid off insiders at testing centers to correct students’ answers, authorities said. A note from Mickelson and his wife, Amy, appears as a testimonial to Singer on a website for “The Key,” another name for his company. They thank him for his support in finding their daughter the right college. “The college process is so layered and confusing. I don’t know what we would’ve done without your insight and belief in our daughter,” said the note, which Mickelson said was a text his wife sent to Singer. His daughter attended Pacific Ridge School in San Diego, where she was a co-captain of the tennis team and the school president. He has two other children, a sophomore and junior in high school, and says he has been using Singer’s company to find them the right colleges. Mickelson said Singer’s company helped to find the right college for their personalities and to make sure they knew what they needed academically and with test scores to be accepted into the college of their choice. A big finish for Tommy Fleetwood and a fast start for Keegan Bradley led each to a 7-under 65 on Thursday for a share of the lead in the opening round of The Players Championship. The move from May to its traditional spot on the calendar brought green, softer conditions and more wind than usual. Even so, Fleetwood was among several early starters who managed to take aim on the TPC Sawgrass. Byeong Hun An and Brian Harman were at 66, while Rory McIlroy also played bogey-free for a 67. Tiger Woods was among the late starters on the Players Stadium Course. Of those playing in the afternoon, Keegan Bradley and Ryan Moore were the only serious threats to catch Fleetwood. Moore had a hole-in-one on the island-green 17th. Harris English had an albatross when he holed out with his second shot on the par-5 11th hole, the third straight year for an albatross in The Players.